09:00-12:00 and 14:00-17:00, Wednesday to Sunday. Closed on Monday, Tuesday and national holidays. Free admission. Duxingshi Village Cultural Park Information Station is located at No.5, Xin-Fu Rd. in the east of the “Wu Wang Zai Ju” stele. It is the largest house on Xin-Fu Rd and occupies an area around 30.6 pings. 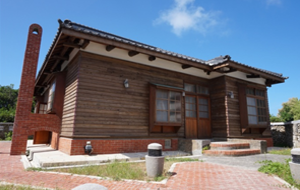 The single-family house was allocated to senior officers under Japanese colonial rule,and the original architecture was preserved, such as the Wagoya frame, the Yosemunedukuri roof, clapboard wall, double red brick chimneys, protruding windows, higher base made of bricks and pathway for dogs and gutters, all of which fully demonstrate the characteristics of the Japanese officer’s dormitories. Since the buildings had become worn down over the years andseverely damaged,the Cultural Affairs Bureau launched a renovation project.The project was completed in 2012 to provide description of the park to tourists and promote the tourism image of Penghu military dependents’community. The exhibition space is divided to three zones. In Zone A, there is a 3D model for visitors to learn about the geographical location as well as historic sites and buildings nearby and a foam board to introduce the origin and history of Duxingshi Village. In Zone B, visitors can learn about the architecture characteristics, future prospects, redevelopment milestones and old photos of military dependents’ community by using the interactive touch screen and the foam board. Commemorative stamps are available in the rest area in Zone C to allow visitors to stamp the moment into their memories. The architecture from the Japanese Colonial Period and after WWII, slogans from the national army and bright red doors in “Duxingshi Village” showcase the life of the troops and their dependents in old times. You may visit thisinteresting place at any time to enjoy the tranquility in the morning, to meditate in the afternoon or to roam at sunset. Follow your heart and arrange a visit to the military dependents’ communityin Penghu now!